This program does NOT work on mac unfortunately. 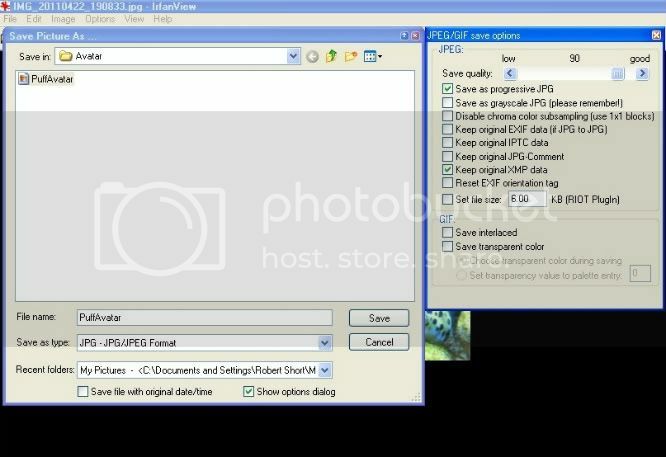 Step 1: Go to http://www.irfanview.com/ click on downloads, and select a download site. Step 2: After you have installed the program, open the file you wish to use as your avatar. Then, click on the screen to draw a box enclosing the area you wish to use as your avatar, then go to the Edit menu, and select Crop selection. This is little Balki sleeping with his bum bum tucked in a hole in the rock. 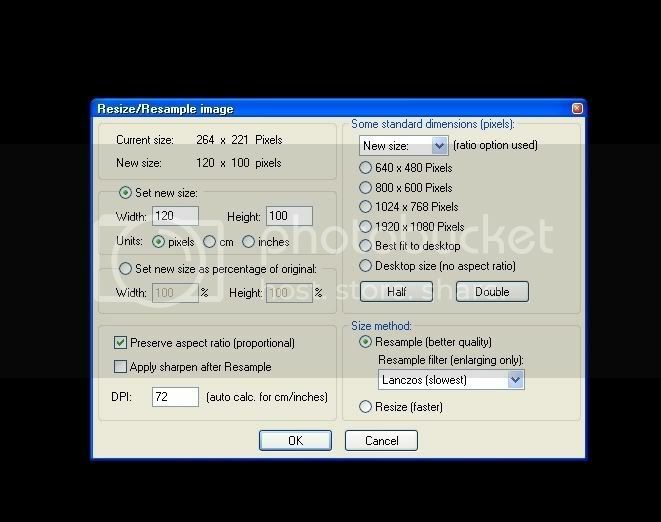 Step 3: Go to the Image menu, and select Resize/Resample. 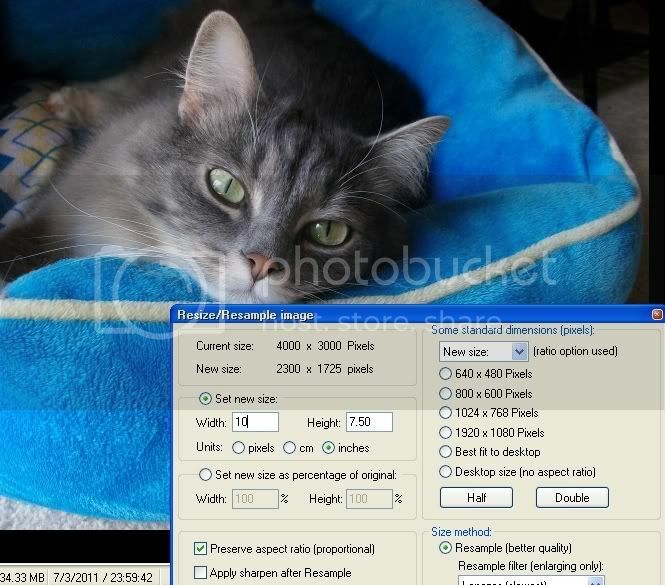 Step 4: Make sure that you have the pixels bubble selected, set your new size and make sure neither the width or height exceeds 120 pixels. Click OK. 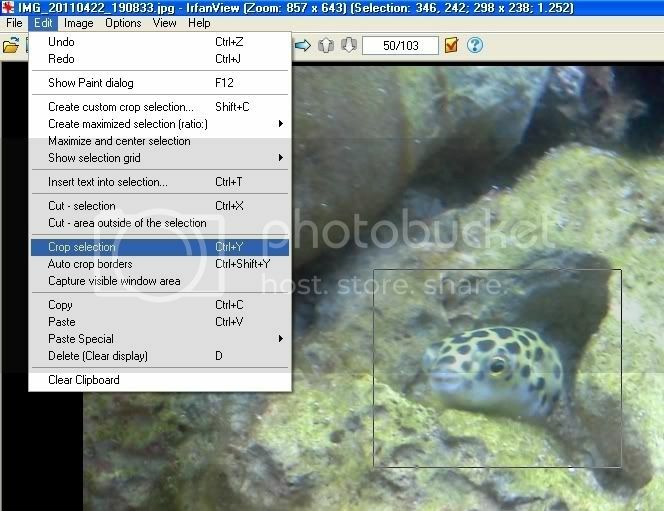 Step 5: Select under the File menu Save as... and select JPG -JPG/JPEG format, and in the JPEG/GIF save options, decrease the slider next to Save quality down to about 90%. Depending on your original file size, this may need to be less, or it could be more than 90% and still be under 6 KB. Step 6: Go to the location of your file and check to see that it is under 6 KB. If it is, then great, it's good to go. If not, you will have to bring down your Save quality percentage until it is under 6 KB. There are of course other ways to do this, but this is just a way that I'm familiar with. 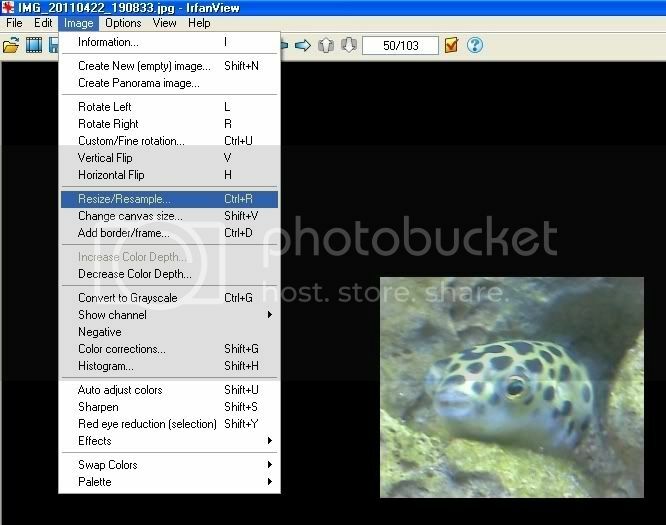 I hope this is helpful to anyone that has been having trouble with getting their cute puffers set as their avatar without them looking like an 80's video game graphic. I was finally able to try a larger picture file at 4.08 MB, and it did work, so let me know if you have any trouble with larger files. Last edited by sevenyearnight on Thu Sep 08, 2011 8:38 pm, edited 12 times in total. This is very helpful, thank you! Here I thought I had to just severely lower the quality of the picture I was taking. I can't get it to work on my mac. I'm completely new to digital photography and editing. If it doesn't work on mac, let me know. 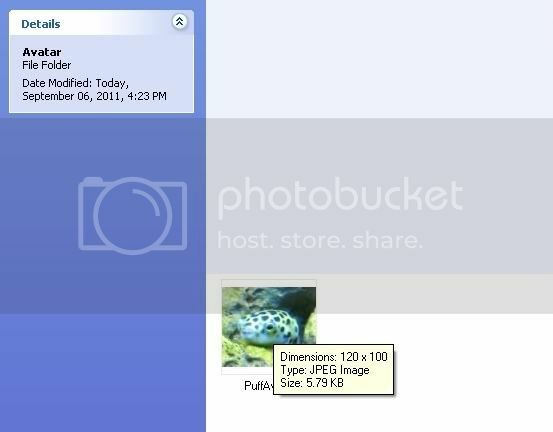 I'm going to try google picasa in the mean time and see if I can do the same thing with that. I'm not Mac savvy, sorry. Maybe someone with a mac has a link to something. If you can't get anything to work, let me know, you can email me the picture already cropped and then I would just need to reduce the size and email it back to you. The GIMP works in OSX and any linux based system, a little more complex than infraview but worth the download. sevenyearnight wrote: Step 1: Go to http://www.infranview.com, click on downloads, and select a download site. That's the wrong link. It's http://www.irfanview.com/. Ah, that looks better. I'll give it a go. Same problem as before, it won't run on a mac. *sigh. I'll have to fish out my old hp laptop and see if I can get it to work on there. I just have all my photos on here so it would be easier. Oops sorry! Yeah, I totally spelled that wrong, I fixed it, thanks! I thought the original site looked sketchy. I couldn't seem to get to what you were describing, although it did link to download sites lol. Sorry, I misspell that program often. It activates my dyslexia or something. Say what? I have Lysdexia. Thanks 7, I made it a Sticky!